Happy New Year! I hope all of you enjoyed the holidays as much as I did! Here’s something simple, healthy and delicious to start off 2017 with! 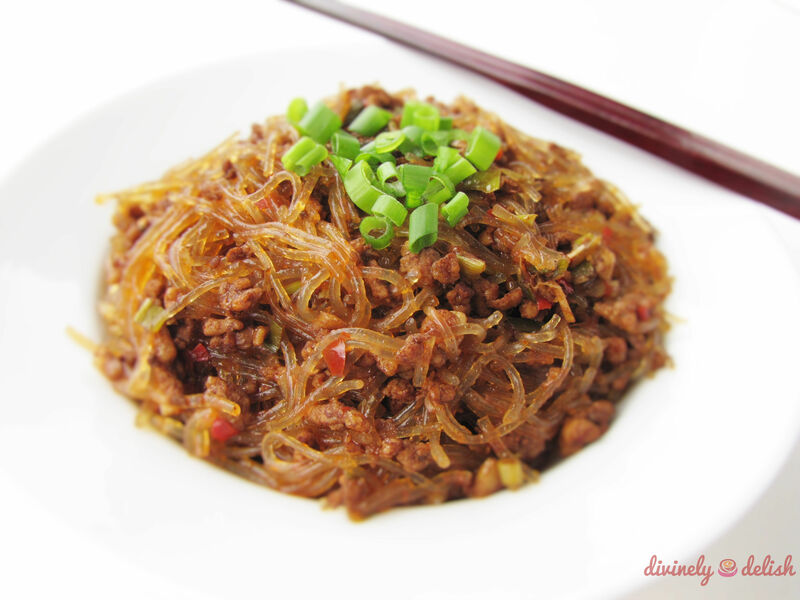 I first discovered this classic Chinese Sichuanese dish of bean thread noodles fried with ground pork many years ago when I spent a semester at Nanjing University in China. One of the students in our group ordered this at one of the restaurants that we frequented, and we all instantly fell in love with this dish. Its name was certainly unique enough to remember –蚂蚁上树 – “ma yi shang shu,” meaning, literally, “ants climbing a tree,” and we would order this at every restaurant we went to! After 4 months in Nanjing, the foodie in me left with memories of this, and Nanjing Salted Duck. Bean thread noodles (also known as bean vermicelli, cellophane or glass noodles) are thin noodles made of, usually, mung bean starch. Not to be confused with rice vermicelli, bean thread noodles become translucent when cooked. You might wonder, what’s with the name “Ants Climbing a Tree”? 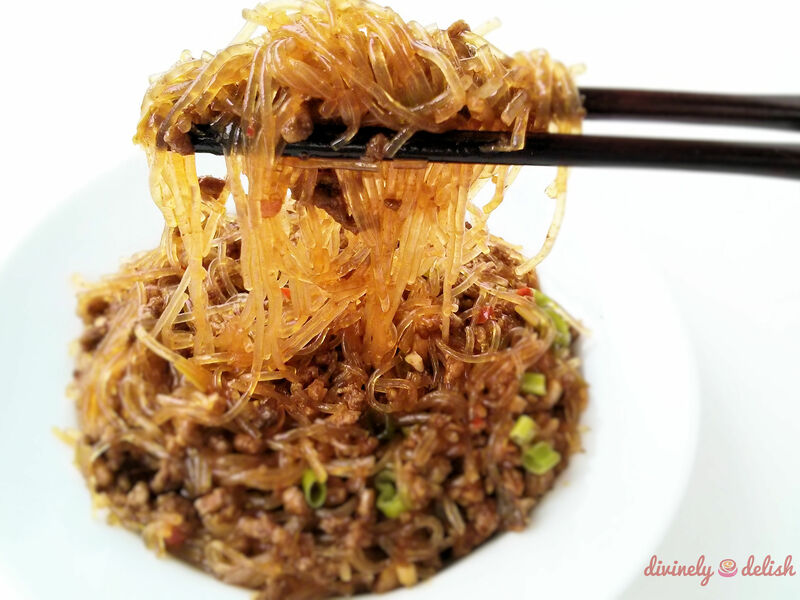 Well, Chinese food names tend to be very descriptive, and I guess if you use your imagination, the little bits of ground meat clinging to the noodles do sort of resemble ants on the branches of a tree, no? I introduced this dish to my family, and over the years, I’ve cooked this countless times for them and friends. Recently though, I came up with a twist on the original, using sea kelp noodles instead. This idea came about by accident. I was shopping one day, and saw some packs of sea kelp noodles. Like shirataki noodles, which I’d eaten before, I knew kelp noodles were also low-calorie and low-carb. But I’d never had them before, so I was excited to buy a pack to try. The instructions on the package suggested eating the kelp noodles raw, in a salad. I had a taste of it raw, and while it’s pretty much tasteless, I was put off by the weird crunchy texture. I figured if I tried boiling it for a few minutes, maybe it would soften up. Much to my disappointment, I realized that regardless of how long you boil the kelp noodles, they don’t get soft! So I gave up on it as a lost cause and just tossed the warm crunchy noodles in a mixture of soy sauce, sesame oil and oyster sauce. While it was flavourful, I still couldn’t get used to the crunchiness, and after a few bites – not wanting to throw it out – I stuck the leftovers in the fridge. To my surprise, they were so delicious! 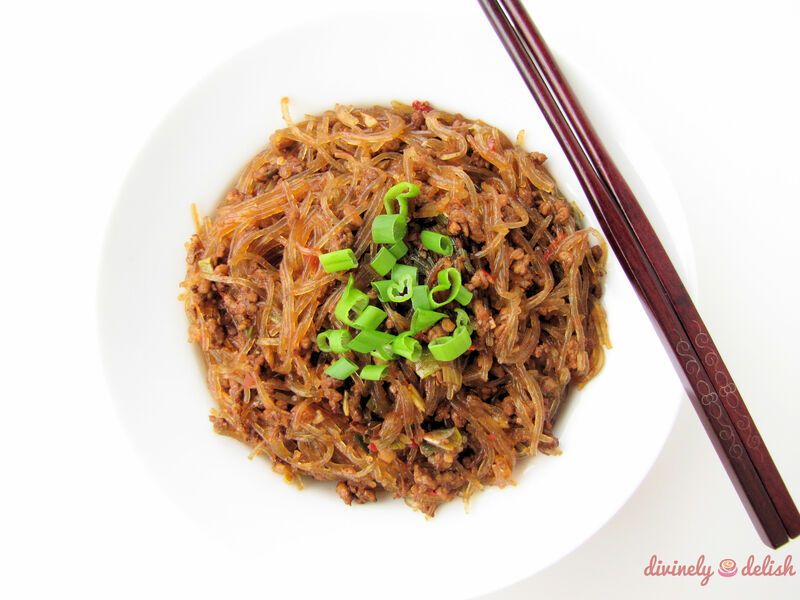 The noodles had totally softened up and they tasted just like bean thread noodles! The texture was exactly the same! And that’s when I thought of using it to make a low-carb version of Ants Climbing a Tree. Obviously, I’ve had to make some adjustments to my original recipe. The important thing is allowing the kelp noodles to cook for a longer time in the sauces/liquid. However, I also discovered that these kelp noodles tend to break up if cooked for too long. So the trick is finding that happy medium where the noodles are soft enough, but it doesn’t look like you’ve gone and cut up all the noodles! I actually find that there’s no need to get them totally soft. I like them just as much when they’re al dente and there’s still a “bite”. I’ve tested this recipe a few times, but it’s still a work in progress! 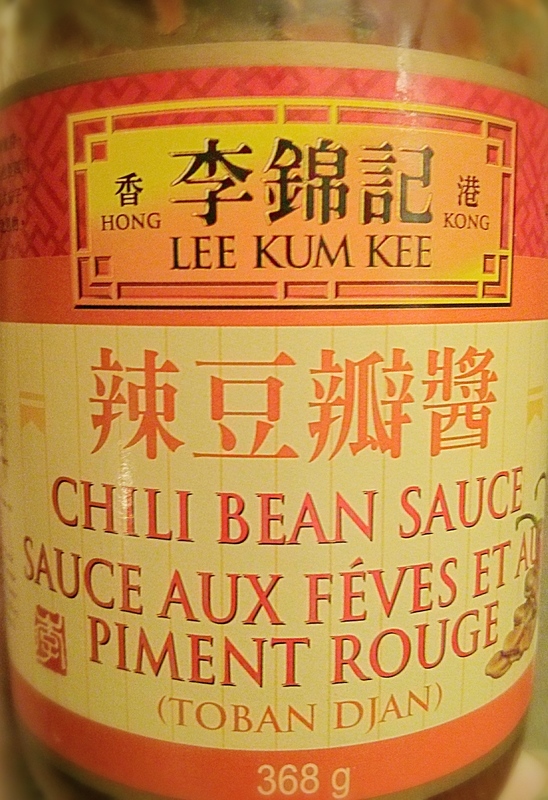 This is the chili bean sauce I use. It’s a paste made of chili peppers and fermented soybeans. 1) Heat oil in a wok over medium-high heat. Fry ginger and garlic for about a minute, until fragrant. Add in 3 tablespoons of green onions, continue frying for half a minute. 2) Add in the ground pork (or chicken), breaking it up and stir frying until the meat is thoroughly cooked. 3) Add chili bean sauce, stock, light soy sauce, dark soy sauce and sesame oil. Mix well. 4) Add in kelp noodles. Stir to make sure the noodles are well coated in the liquid. 5) Simmer on medium heat for about 10 minutes, gently stirring occasionally, until liquid is reduced by about half. Continue stirring on low heat for a few more minutes to further soften noodles (they will be al dente). 6) Dish out, garnish with green onions, and serve on its own or enjoy with steamed rice. Note: If you do happen to leave the noodles out for some time, they will continue to soften until the texture is like that of bean thread noodles. So your leftovers might actually taste even better!